What do you love about working at Float Sixty? : Our team is full of beautiful people attempting to love themselves and others. What's one interesting fact about you? : I lived in South Korea for 3 years. Interests outside of work? : Just living. Sitting by the lake reading a book. Riding bikes around town. Running. Listening to podcasts. Favorite place on Earth: I spent a week in a little fishing village outside of Hoi An with my wife and friend and would have been thrilled to never leave. Personal philosophy that you live by: Simplify. Simplify. Simplify. Why do you float? : Floating optimizes my whole wellbeing. What do you love about working at Float Sixty? : I love meeting such interesting, unique people. That includes the people I work with, I love our float team! What's one interesting fact about you? : I have an inner rebellious side with a twist of gypsy soul. Interests outside of work? : Country Music - I can two-step like a true country girl. Favorite place on Earth: The BEACH! Or anywhere warm and tropical. Personal philosophy that you live by: Do something for yourself that your future self will say thank you for. Why do you float? : I float to unplug from my technology, and the stress that comes with being a college student. Floating not only helps with any pain and soreness, also to destress and calm any anxiety I have! What do you love about working at Float Sixty? 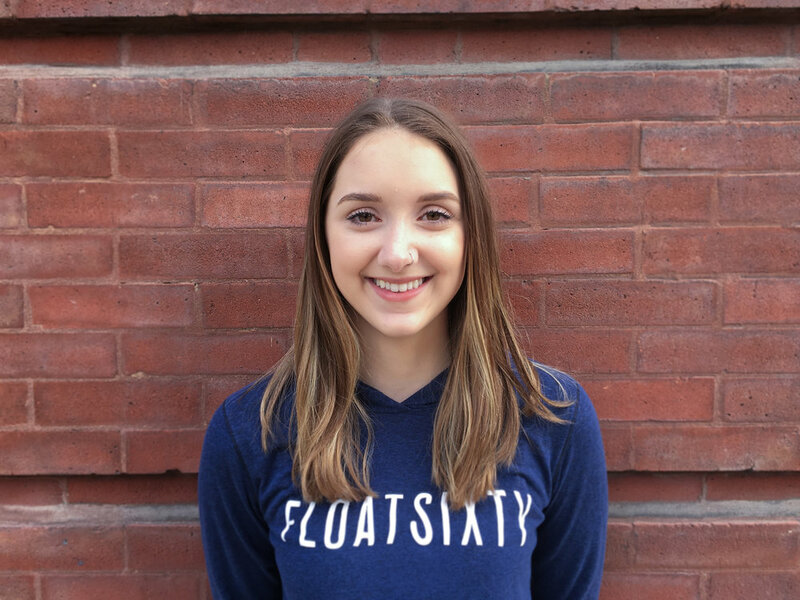 : I love coming in to work at Float Sixty knowing that the services we provide help our customers feel better about themselves, their bodies, and improve their lives. What's one interesting fact about you? : I'm double-jointed in my elbows and it freaks my boss out. Interests outside of work? : Outside of work I love to hike, paint, and cook. Favorite place on Earth: Havasupai Falls, Arizona. Personal philosophy that you live by: Trust the process. Three things that describe you: Coffee, flowers, and art. What do you love about working at Float Sixty? : The community we have here is like no other. I'm so grateful to have my work be a place of relaxation and filled with energizing and compassionate people. Why do you float? : Floating makes me stop for longer than ten seconds. Which is hard to do for me. Interests outside of work? : Circus, art of all sorts, and petting dogs. Why do you float? : I float for a myriad of reasons, most notably for physical relief, as an anxiolytic, and to help me become more self aware and explore my consciousness. What do you love about working at Float Sixty? : It's the best job I've ever had. I love it so much because I don't dread coming to work, in fact I occasionally look forward to it, mostly whenever I know I'll be working with our dear leader Gloria! Interests outside of work? : Computers, Botany, Chemistry, anything Entheogenic, high-end audio equipment, Photography, Gaming, and much more that I will not bore anyone with. Personal philosophy that you live by: Question Everything and don't perpetuate the spread of ignorance. Why do you float? : There is not just one singular thing that floating does for [me]. Floating does for me what ever my mind and body need the moment I step inside a tank. Anything from an escape and reset from the daily stresses of life to a perfect environment for my practice of meditation. If I am not in need for a sensory deprivation session then I can give a podcast or class lecture my undivided attention completely void of all distractions by plugging my phone into the tank. What do you love about working at Float Sixty? : I am blessed to be able to work to share a service and an experience that has greatly impacted my life to anyone that walks through the doors. Not only am I proud of and completely stand behind the service that Float Sixty provides, but I am constantly blown away by the team that I get to work with on a daily basis. The fellow co workers that we have here are some of the most genuine, helpful and kind hearted people I have ever met. The family here is one I would not trade for a single thing. What's one interesting fact about you? : I have not yet visited every country in the world. Interests outside of work? : The explorations of all aspects of life. My mind and body thrive on the act of creating and serving. I am constantly looking for new adventures and new experiences. Anything from transforming a full size school bus into an RV and road tripping across the US, to attempting to figure out why it is a crime to poor my milk before the cereal. I also find it interesting that it is becoming a normal thing to constantly prove to your computer that you are not a robot by clicking a few images. Favorite place on Earth: My favorite place on Earth is anywhere that causes me to look at life in a new light. What fictional character, celebrity, or historical figure do you most identify with? : I have never made a conscious effort to identify or compare myself to a fictional character, celebrity or historical figure. I will have to get back to you if I ever get around to that. Why do you float? : Relaxes my back body and puts me in a meditative flow. What do you love about working at Float Sixty? : Seeing clients come out of their tanks relaxed, happy and peaceful. What's one interesting fact about you? : I've been on Korean television. Interests outside of work? : Biking, dancing, cooking and in general, just being outside. Favorite place on Earth: Hmm... Kyoto, Japan? Also, my bed. Personal philosophy that you live by: Life can be hard for everyone at times. Put out positive vibes. Be kind. Why do you float? : I float as a reprieve from sensory bombardment, and to access a deeper meditative state. What do you love about working at Float Sixty? : That we're providing a service which improves lives and promotes mindfulness and introspection. This is a very human and honest environment, which is difficult to find in our system of hyper-capitalism and consumerism . Interests outside of work? : Absurdism, surrealism, subversion. English. Curries of all colors. Videogames. Books. Listening to the ocean in the dark. Personal philosophy that you live by: Get it how you live. Why do you float? : Floating is a super meditation for me. I get all the benefits of meditation plus the benefits of floating! What do you love about working at Float Sixty? : I love working with open-minded individuals and getting to know our diverse clientele. Favorite place on Earth: Summer Camp Music Festival!! !